You can change the layout of your products list page by picking one of the four designs. As you can see first one is with centered text, second with text on the left, third has the text shown on mouse hover and fourth is in a boxed styling. 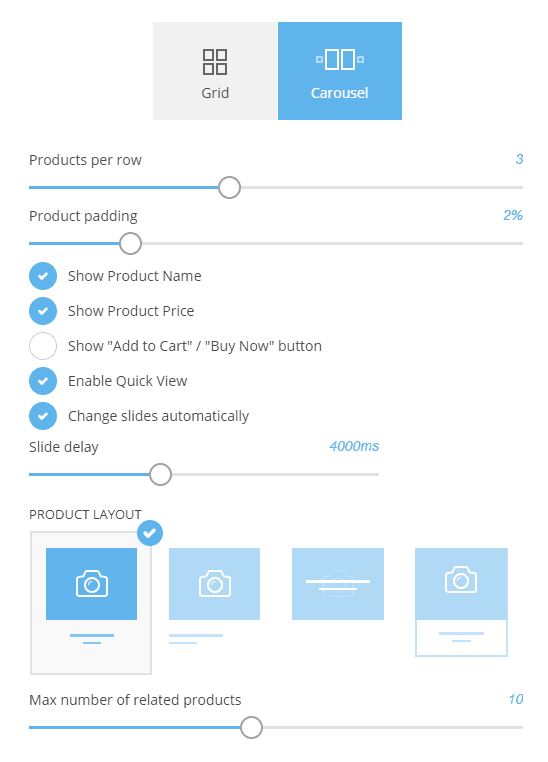 To edit the layout of your product page you pick one of the other 4 designs. The only difference is the position of the image and proportions. In the settings below you can add circle zoom lens to zoom the product image when you go with the mouse on top of it. Following that is the related products option that will add products from the same category (if there are any) at the bottom of each product page. In the related product's section you can adjust the layout of the related products shown.